A Boeing 737-2L9, registered 5N-BFN, was destroyed in an accident near Lisa Village, Ogun State, Nigeria. All 111 passengers and six crew members were killed. Bellview flight 210 was the return flight from Abidjan (ABJ), Ivory Coast to Abuja (ABV), Nigeria with en route stops at Accra (ACC), Ghana and Lagos (LOS), Nigeria. In preparation for the last leg of the flight, the pilot of Flight 210 contacted Lagos Tower at 20:17 and requested clearance for start-up. The controller gave him the temperature and QNH, which were 27 degrees Centigrade and 1010 millibars respectively. At 20:24, the pilot requested and got approval for taxi to runway 18L. The tower controller then issued the route clearance via Airway UR778, Flight Level 250, with a right turn-out on course. The pilot read back the clearance and the controller acknowledged and instructed the pilot to report when ready for takeoff. At 20:27, the pilot requested "can we have a left turn out please?" and soon afterwards his request was granted by the controller. One minute later the tower cleared flight 210 as follows: "BLV 210 runway heading 3500ft left turn on course" Which was read back by the pilot who also reported ready for takeoff. After reporting the wind condition as 270 degrees at 7 knots the controller cleared Flight 210 for departure at 20:28. The pilot acknowledged the clearance, and at 20:29 requested "And correction, Bellview 210, please we will take a right turn out. We just had a sweep around the weather and right turn out will be okay for us." The controller responded "right turn after departure, right turn on course" and the pilot acknowledged. At 20:32 the pilot made initial contact with Approach Control and reported "Approach, Bellview 210 is with you on a right turn coming out of 1600 (feet)". The Approach controller replied "report again passing one three zero." The pilot acknowledged at 20:32 and that was the last known transmission from the flight. The airplane struck the ground on flat terrain in a relatively open and wooded area, 14NM north of the airport. The next morning the wreckage was found about 30 km (20 miles) north of Lagos. 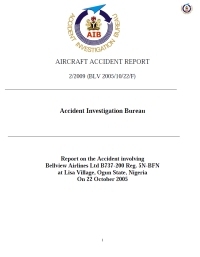 The AIB, after an extensive investigation, could not identify conclusive evidence to explain the cause of the accident involving Bellview Flight 210. The investigation considered several factors that could explain the accident. They include the PIC training of the Captain before taking Command on the B737 aircraft which was inadequate, the cumulative flight hours of the pilot in the days before the accident which was indicative of excessive workload that could lead to fatigue. Furthermore, the investigation revealed that the airplane had technical defects. The airplane should not have been dispatched for either the accident flight or earlier flights. The absence of forensic evidence prevented the determination of the captain’s medical condition at the time of the accident. The missing flight recorders to reconstruct the flight also precluded the determination of his performance during the flight. Due to lack of evidence, the investigation could not determine the effect, if any, of the atmospheric disturbances on the airplane or the flight crew’s ability to maintain continued flight. The operator could not maintain the continuing airworthiness of its aircraft, in ensuring compliance of its flight and maintenance personnel with the regulatory requirements. The Civil Aviation Authority’s safety oversight of the operator’s procedures and operations was inadequate. NCAA should ensure that its safety oversight functions on airlines are such that they; (a) Increase the effectiveness of the surveillance on airline operations to promptly identify and respond to potential safety problems. (b) Effectively implement the airlines procedures for training and licensing of flight and maintenance crew. NAMA should expedite action on the provision of radar coverage of Nigeria airspace to enhance effective Air Traffic Services (ATS) and Search And Rescue (SAR) operations. Bellview Airlines should ensure that; (a) Maintenance tasks are certified in a sequential and timely manner; (b) Deferred defects are properly placed in Hold Item List (HIL); (c) Repair intervals are not exceeded beyond the relief provided by Minimum Equipment List (MEL); (d) Suitable actions are taken to sensitize maintenance staff of their professional responsibilities, the limit of their authorization and that approval from appropriate authority is required when it becomes necessary to deviate from approved instruction and procedures. Bellview airlines should review its safety and quality control to ensure the following; (a) Maintenance activities are carried out in accordance with approved maintenance program and established engineering best practices. (b) Standardization and control of flight crew training (base, conversion to type, LOFT and currency) are fully implemented.